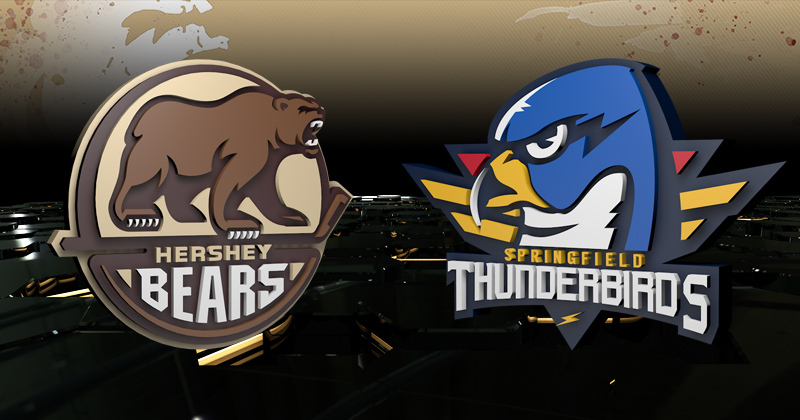 02/06/2019 - The Hershey Bears return to action with a Atlantic Division match up against the Springfield Thunderbirds. Hershey's last regulation loss came at the hands of the Thunderbirds on Jan. 11, and they have since earned points in nine straight. The Hershey Bears skated to a 3-2 shootout win over the Belleville Senators on Super Bowl Sunday at Giant Center. The victory extended Hershey's current point streak to nine games (8-0-0-1). Shane Gersich opened the scoring with a breakaway goal 7:11 into the first period. After the Sens drew even only 1:37 later, Mike Sgarbossa tallied his team-best 21st goal of the season at 10:43. The Sens once again evened the score, courtesy of a goal by Drake Batherson 1:00 into the third period. After the Bears successfully killed a major penalty assessed to Nathan Walker in the final 3:33 of regulation, and overtime, and eventually a shootout was required to decide a victor. Riley Barber scored the lone shootout goal in the top of the first round, and Vitek Vanecek stopped all three shooters for the win. Springfield will look to bounce back after dropping a 4-3 decision to the Utica Comets on Saturday. Sebastian Repo, Jacob MacDonald and Jamie McGinn scored for the T-Birds. After winning the first match up against Springfield this season, the Chocolate and White proceeded to drop the next three tilts, being out scored 14-5. Riley Barber has produced four points (one goal, three assists) in four meetings against Springfield. On the flip side, T-Birds forward Anthony Greco, recently named fastest skater in the 2019 AHL Skills Competition, has scored five goals in four games this season against the Bears. Harry Zolnierczyk has also tallied five points (one goal, four assists) in five games against Hershey. In Hershey’s nine-game point streak (8-0-0-1), the Bears have outscored opponents 29-14. Since the streak started Jan 12, the Bears have out shot the opponent in eight of the nine games, and 281-206 overall. In the run, the penalty kill is 33-for-39 (84.6%). Mike Sgarbossa leads all Bears with 11 points (five goals, six assists) during the streak. Defender Ryan Sproul has scored the game-winning goal on three different occasions. Netminder Ilya Samsonov is 5-0-1 with a 0.98 goals against average and a .953 save percentage, while fellow goalie Vitek Vanecek is 3-0-0. Entering tonight, the Bears have scored the game’s first goal in 14 of the past 15 contests. The Bears are 17-7-0-2 when they notch the game’s opening tally. Hershey has scored first 26 times this season, the second highest total in the Atlantic Division, only trailing Bridgeport (27). Both Mike Sgarbossa and Nathan Walker have scored the first goal of the game six times, a mark that is tied for first in the AHL. During the Bears nine-game point streak, the club has kept opponents under 30 shots in each game, under 25 shots on five occasions, and under 20 shots twice. Opponents are averaging just 22.88 shots per game during the point streak. The Bears allow the sixth least shots in the AHL per game (27.72), a ranking that has improved from 12th at the start of the streak.